The name that the Nez Perce call themselves is Nimíipuu, which means “The People”. Anthropologists believe that the Nez Perce descended from the Old Cordilleran Culture, which moved from south from the Rocky Mountains, and west into Nez Perce territory, which included parts of Washington, Oregon, Montana, and Idaho. In 1805 the Nez Perce were the largest tribes on the Columbia River Plateau, with a population of about 6,000. There were more than 70 permanent villages ranging from 30 to 200 individuals, depending on the season and social grouping. About 300 total sites have been identified, including both camps and villages. The Nez Perce lived in bands which were divided as the Upper Clearwater River and the Lower of the Wallowa Valley. Each band with its own territory and group of composite bands. These bands then subdivided into smaller bands of people living in villages along streams and rivers, together making up the politically unified composite band. The different bands were generally identified by using the name of the tributary stream that they lived near. Each village was led by a headman, and was made up of several related, extended families. The head man was generally one of the elder men of the group, attending to the general welfare of the village members. This was generally an inherited position, although the headman was at times also a shaman who was a religious figure, and healer. The largest village within the composite band had a band leader, including the administrating peace chief, and the war chief. The village council was made up of the band leaders, and important warriors. The council was in charge of making major decisions involving the village. The band leader was elected by the village council even though the position could be semi-hereditary. The Nez Perce were migratory and would travel with the seasons, according to where the most abundant food was to be found at a given time of year. This migration followed a predictable pattern from permanent winter villages through several temporary camps, nearly always returning to the same locations year after year. They were known to go as far east as the Great Plains of Montana to hunt buffalo, and as far west as Celilo Falls to fish for salmon on the Columbia River. They relied heavily on quamash or camas gathered in the region between the Salmon and Clearwater River drainages as a food source. William Clark was the first American to meet any of the tribe. While he, Meriwether Lewis and their men were crossing the Bitterroot Mountains they ran low of food, and Clark took six hunters and hurried ahead to hunt. In 1804, near the western end of the Lolo Trail, he found a small camp at the edge of the camas-digging ground. The explorers were impressed by the Nez Perce, who resupplied and aided the men. This aid probably saved the expedition from certain failure. Up until this point, the Army never had any trouble with the Nez Perce. During the 1870s, as more white settlers moved into Nez Perce territory, tensions began to build. The hostilities that had been developing during this time, between settlers and the Nez Perce turned into violent conflict during mid-June, 1877. The first engagement between the Army and the Nez Perce warriors was at White Bird Canyon, Idaho Territory, on June 17. For the Nez Perce it was a major victory. At White Bird Canyon they proved to be an effective fighting force. 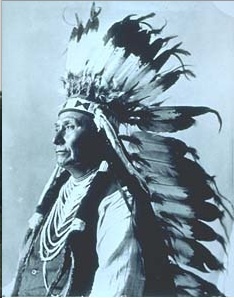 Throughout the summer and early fall of 1877, the fighting skill of the Nez Perce warriors and the military tactics of Nez Perce military leaders, such as Chief Looking Glass and Chief White Bird, enabled the Nez Perce to evade almost certain defeat by superior U.S. Army forces. Nez Perce strength during the 1877 war was estimated to be a few hundred warriors. They had no formal military training and travelled with many noncombatants. The Army, however, would use several thousand soldiers during the 1877 Nez Perce campaign. These were commanded by veterans of the Civil War with years of military training and experience. The Nez Perce and the Army engaged several times as the Nez Perce traveled from their homeland in the Wallowa Valley through the Montana and Idaho Territories towards their goal of Canada. By October, 1877, however, approaching winter weather, lack of supplies, and the effects of traveling more than 1,500 miles over rough western territory had began to take its toll. Aca,! Hear me, my chiefs! I am tired. My heart is sick and sad. From where the sun now stands I will fight no more forever. Aca,! The Nez Perce were promised by General Miles a safe return to the Wallowa Valley. General Miles was overruled, and the Nez Perce were instead sent to Kansas and Oklahoma, where the survivors of 1877 endured many more years of hardship. It was not until the mid 1880s that the Nez Perce were allowed to return to their homelands. Joseph and the other remaining tribal leaders spent their remaining years on the Colville Indian Reservation. The Nez Perce war would not be the last conflict where the decisions and promises of battlefield commanders would be influenced by higher political forces and a physically distant command structure. 1. What is the name that the Nez Perce call themselves? What does it mean? 2. In 1805, Nez Perce were the largest tribes on the Columbia River Plateau, approximately how large was their population ? 3. The Nez Perce lived in bands. How were they divided? 4. What were some of the responsibilities of the “head man” of each village? 5. Why were the Nez Perce migratory? 6. Who was William Clark? 7. The Nez Perce and the white settlers managed to coexist peacefully, until around the 1870s. What happened to caused a violent conflict between the settlers and the Nez Perce in 1877? 8. The last engagement between the Nez Perce and the Army was fought at Bear Paw Mountain, Montana Territory. This battle took place between September 30 and October 5, 1877. Why did Chief Joseph surrender his remaining forces? Larry Greene-Tribal Official. Photo: Nez Perce site. • representing the Tribe in negotiations. • promoting and protecting the health, education and general welfare of the Tribal members. 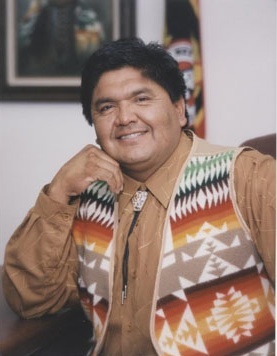 • administering unrestricted Tribal funds. • prescribing rules governing nominations and elections of NPTEC. There are also various Tribal Departments to handle other affairs of the tribe. The largest resource are the Nez Perce Fisheries, there are police and fire departments, as well as departments of health and human services. 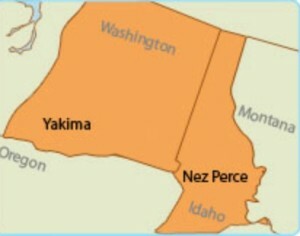 In addition the University of Idaho has a Nez Perce Reservation Extension Program. In addition to the horsemanship program, the Nez Perce Reservation Extension Educator is providing educational support to the Lapwai High School FFA program in the areas of soil science, horse judging and horsemanship. The Seven Devils Gorge or Hell’s Canyon of the Snake River forms part of the boundary between Oregon and Idaho. On the Idaho side of the gorge, which is said to be the deepest canyon on the North American continent; they are seven high peaks stand in a semicircle. They are called the Seven Devil Mountains. The Blue Mountains are in Eastern Oregon and Washington. The myth given here was corroborated and details were added by Caleb Whitman, a Nez Perce on the Umatilla Reservation, in August 1950. Long long ago when the world was very young, seven giant brothers lived in the Blue Mountains. These giant monsters were taller than the tallest pines and stronger than the strongest oaks. The ancient people feared these brothers greatly because they ate children. Each year the brothers traveled eastward and devoured all the little ones they could find. Mothers fled with their children and hi them, but still many were seized by the giants. The headmen in the villages feared that the tribe would soon be wiped out. But no one was big enough and strong enough to fight with the seven giants at a time. But Coyote really did not know what to do. He had fought with giants. He had fought with monsters of the lakes and monsters of the rivers. But he knew is could not defeat seven giants at one time. So he asked his good friend Fox for advice. So Coyote called together all the animals with claws — the beavers, the whistling marmots, the cougars, the bears and the rats and mice and moles — to dig seven deep holes. Then Coyote filled each hole with a reddish-yellow liquid. His good friend Fox helped him keep the liquid boiling by dropping hot rocks into it. Soon the time came for the giants’ journey eastward. They marched along, all seven of them, their heads held high in the air. They were sure that no one dared to attack them. Coyote and Fox watched from behind some rocks and shrubs. Down, down down the seven giants went into the seven deep holes of boiling liquid. They struggled and struggled to gt out but the holes were very deep. They fumed and roared and splashed. As they struggled they scattered the reddish liquid around them as far as a man can travel in a day. Then Coyote came out from his hiding place. The seven giants stood still. They knew Coyote. Coyote caused the seven giants to grow taller, and then he changed them into seven mountain peaks. He struck the earth a hard blow and so opened up a deep canyon at the feet of the giant peaks. Today the mountain peaks are called “The Seven Devils.” The deep gorge at their feet is known as Hell’s Canyon of the Snake River. And the copper ore scattered by the splashing of the seven giants is still being mined there in that area.